Jimmy Walker is the fourth first-time major winner in 2016. In a season that began with a Big Three, we now hail the ascendancy of the Fresh Four. Three plus four, if you're into advanced metrics, makes seven, which also happens to be the number of experts on both sides of the Atlantic who thought 2016 would give us four first-time major champions. 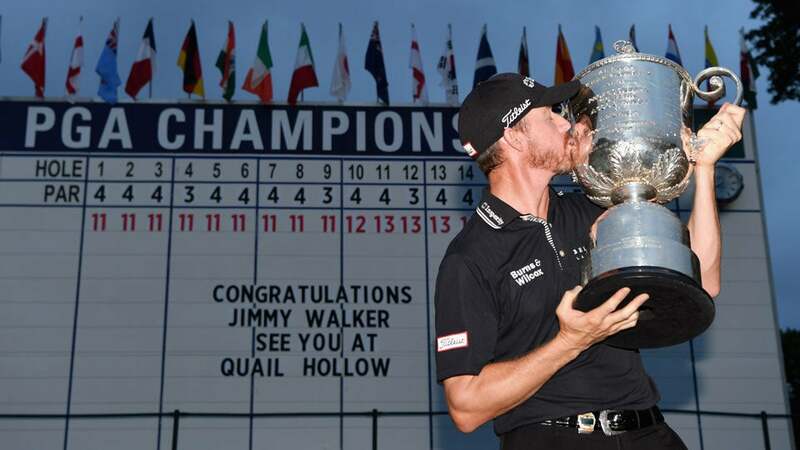 Thirty-seven-year-old Jimmy Walker ran the final 36-hole leg on Sunday, enduring an afternoon of lift-clean-and-place artificiality to win the PGA Championship at Baltusrol Golf Club. The lanky, trim-bearded Texan was a popular winner, looking, as he does, like a Nashville songwriter or a refugee from the Kansas City Royals bullpen. He finished in grand style, playing bogey-free golf over the final 28 holes. But many fans were disappointed that Jason Day, last year's PGA champ and this year's runner-up, failed to repeat. Day made a 14-footer for eagle on the 72nd hole, but he would have needed an albatross to force a playoff. "I'm just happy that we put on a great show," Day said, looking every inch a winner. It was that kind of season. Danny Willett won the Masters, denying defending champion Jordan Spieth's fans the pleasure of a Texas two-step. Dustin Johnson won the U. S. Open at Oakmont, overcoming an ugly rules screwup to win by two (or three). Then came Henrik Stenson, who took the thrill out of Phil with a record-setting win in the Open Championship at Royal Troon. "I think it shows that everybody out here is playing good, and everybody's got a chance to win," Walker said at his Sunday press conference. "Everybody expects big things from guys like that." How, you may ask, did the analysts get it so wrong? Answer: They didn't. When you look at cumulative scores for the four majors, Day finished first at nine under par, and Spieth was second at three over. Argentina's Emiliano Grillo, who was 13th at Baltusrol, was plus-10 over 16 rounds, good for aggregate third, with Kevin Na (plus-13) and Lee Westwood (plus-14) filling out the top five. Is this even a thing? I say it is. For years now I've been calling on some progressive corporation to sponsor an "aggregate trophy" for the low scorer over 16 major-tournament rounds. (The Chipotle Cup? The GOLF.com Trophy? The Amazon Prime Jug?) Along with the hardware, I propose that the winner of golf's marathon be paid a six-figure sum greater, by at least one dollar, than the $1.8 million handed out to the Masters and U.S. Open champ. Last year's aggregate winner, by 19 strokes, would have been Spieth, who was a whopping 54 under par and finished no worse than T4 on golf's biggest stages. In 2014, the prize would have gone to Rickie Fowler, who received virtually no recognition for his achievement, and thus hasn't bothered to repeat it. Thinking in the aggregate provides some useful perspective. McIlroy, for example, missed the cut at Oakmont and Baltusrol, after making double-bogey and bogey, respectively, on his 36th hole. Even one missed cut washes a player out of the aggregate race, so McIlroy's major season was a major dud. Spieth, on the other hand—despite his confidence-shattering forfeiture of a five-stroke Sunday lead at Augusta National—finished T2 at the Masters, 37th at the U. S. Open, 30th at the Open and 13th at the PGA. The 23-year-old left all four of those venues feeling that his game had betrayed him, but in the aggregate he was better than everyone but Day—who, my analyst friends will be quick to point out, lived up to his No. 1 ranking, even if he achieved no better than a No. 2 finish. Willett, despite his Masters win, was well back in the aggregate pack with ho-hum finishes of 37th, 53rd and 79th. (He'll play for England in Rio, so let's give him a bronze medal.) That, hilariously, leaves Johnson and Walker dead-last among the winners. Johnson, with his Oakmont win and T4 and T9 finishes at Augusta and Troon, had the title all but wrapped up before Baltusrol. Alas, he fired rounds of 77-72, missed the cut and failed to complete golf's sternest test. Walker, too, neglected to paint all the numbers, departing Oakmont and Troon early. But Sunday's win, the sixth of his PGA Tour career, put a smile on his face and made him a candidate for next year's Big Three, if we decide to continue that tradition. "For me it was a matter of time," Walker said, offering hope to the Garcias, Koepkas and Matsuyamas, among the shuttered souls who have yet to win a major. But I'm left thinking: When will Day get his day? It's time for corporate America to put up the bucks and give golf's aggregate majors champion the recognition he deserves. Time Inc. Trophy has a nice ring to it, don't you think?